February, 27th: The World Campus — Japan Class of 08 went to Minamata city, which is nearly two hours away from Kumamoto city by bus. 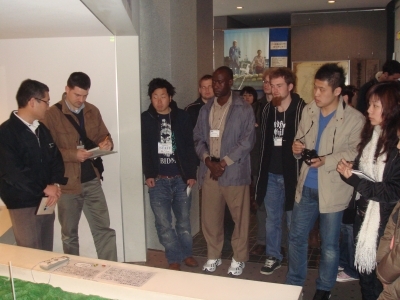 This trip was especially arranged for the participants to learn about how pollution created the infamous Minamata Disease. Minamata disease was caused by the high levels of methylmercury contained in the effluence released into the Shiranui Sea by the Chisso Minamata factory. The toxin accumulated in the tissues of fish and other aquatic life, which were then consumed by the local population. In the early 50s, villagers did not realize the severity of horrible disease but were merely laughing at those sick cats that were first poisoned by the polluted fish. The laughter finally changed into somber sobs when the first human patient was diagnosed in Dec. 1953. Soon methylmercury poisoning was found in new-born babies because their mothers had eaten local seafood during pregnancy. Darkness and gloom enveloped the whole Minamata region. The disease did not only destroy people’s health but also shattered our trust in humanity. Countless tears have been shed. The health and lives lost cannot be restored. We have learned this lesson with our visit to the Minamata Disease Municipal Museum and wish to prevent another such disaster from ever occurring again. Every participant in World Campus — Japan program is willing to pass on the message of the misery caused by pollution and the preciousness of life.